The Smuttynose craft beer brand ‘is very resilient|! !|’ says Richard Lindsay|! !| CEO of the brewery. He is heading up the turnaround of the company|! !| which was acquired at auction earlier this year. The ongoing revival at Smuttynose Brewery in Hampton took a fun turn in July when the company held an in-house brewing competition among 10 teams and hosted a recent visit by Gov. Chris Sununu. 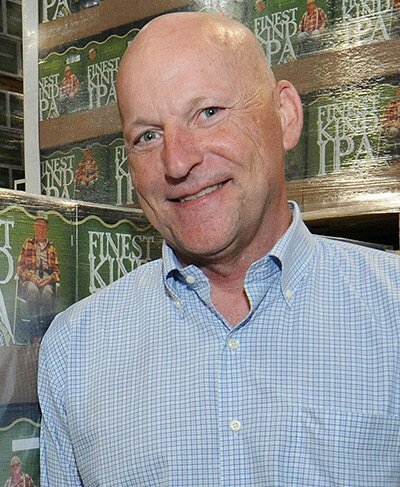 Smuttynose has moved forward from a financial bottom that forced an auction sale of the company earlier this year, first to Provident Bank and then to Runnymede Investments, a local private equity firm. It’s also a sign that the brewery — named after the third-largest island in the Isles of Shoals and founded in 1994 — was going back to its innovative roots. According to Craft BrewingBusiness.com, New Hampshire has the seventh-highest rate of craft breweries per 100,000 residents in the country (5.6) and Smuttynose has been one of the most prominent in New England. But the company co-founded by Peter Egelston was overleveraged from a $22 million investment to build a new, LEED-certified brewery and restaurant on Towle Farm Road, which opened in 2014. Runnymede tapped Lindsay, a California native and U.S. Navy veteran, whose long management and consulting career includes stints with Boston Beer Company (aka Sam Adams) and Bentley Pharmaceuticals. Lindsay has revived the Smuttlabs research and development arm of the brewery and enhanced the canning operation. He told NH Business Review he is determined to leverage the opportunities that come with a legacy brand (which has more than 100 and counting craft beer recipes), a popular restaurant and a farm field location brimming with potential. Q. What have been the top challenges since taking over in the spring? A. I have three in no particular order. First, there was a huge awareness challenge. A lot of people assumed it was closed, even after the auction. There is a different ownership and capital structure, but a lot of people didn’t pick up on that. Second, the inventories were severely depleted, and we’ve been working hard to sort out that puzzle. Production cycles take the minimum of a couple of weeks. The crew did a magnificent job of getting us back on track and I’ve had a lot of phone calls with our vendor base to reassure and keep them informed. Finally, our evaluation of the Smuttynose brand itself has been interesting. We discovered what this first-generation craft brand meant to consumers. We’ve learned the brand is very resilient. During the pre-auction period people were buying a lot of product because they thought it was the end. People identified with the Smuttynose brand, found it likable and reliable. Q. Why the emphasis on canning? A. Even before the folks at Runnymede put a bid in, it was becoming clear cans are really a big part of the craft beer market and Smuttynose needed it. Bottles are good for certain occasions, but cans are a huge part of the market, and they are preferred at many outdoor venues like, for example, Fenway Park or at concerts. There was a quality stigma in the first generation of cans in the craft beer industry but that’s no longer there. You need to have a can package to compete. Q. How does Smuttynose maintain its brand in the competitive craft beer industry? A. There are more than 6,000 craft breweries nationally, and with that level of competition it’s important to pick the right geography. One of the nicer parts of being in New Hampshire is that we have a lot to work with. We are the preeminent New Hampshire craft brand, so it makes the most sense for our strategy to have a strong New England regional footprint. We have the legacy for it and a return to innovation with Smuttlabs. With new levels of experimentation, we plan a rotational series of a couple of new brands, like (recently released) Lady Stardust every month. We can do these in small batches and really have some fun. Q. In a year, what will we be saying about Smuttynose? A. We will have new beers along with our favorites. The Hayseed Restaurant has a new menu and we’ve added a new smoker. We are opening the venue up to more public events. The monthly “Yappy Hour” is one of my favorites. It benefits the New Hampshire SPCA ($1 from each pint of beer sold), and customers are welcome to bring their dogs. We want to engage people more by getting them to come here, have a couple of beers you can only get on site at a picnic-type venue for the family. Q. Do you have a favorite Smuttynose beer? A. Old Brown Dog. It’s our second most popular brown ale.